I am not going to lie. I have only seen one other Doris Day film. I think I don't click with Doris the way I have clicked with other actresses like Deanna Durbin or Virginia Gibson, who happens to be in this film. But when I saw that Michaela over at Love Letters to Old Hollywood was doing a blogathon in honor of Miss Day's 97th birthday, I knew I had to try and give Doris another chance. The movie I choose is Tea for Two. It stars Doris Day, Gordon MacRae, Gene Nelson, Eve Arden, Billy De Wolfe, S.Z Sakall, Virginia Gibson, and Patrice Wymore. 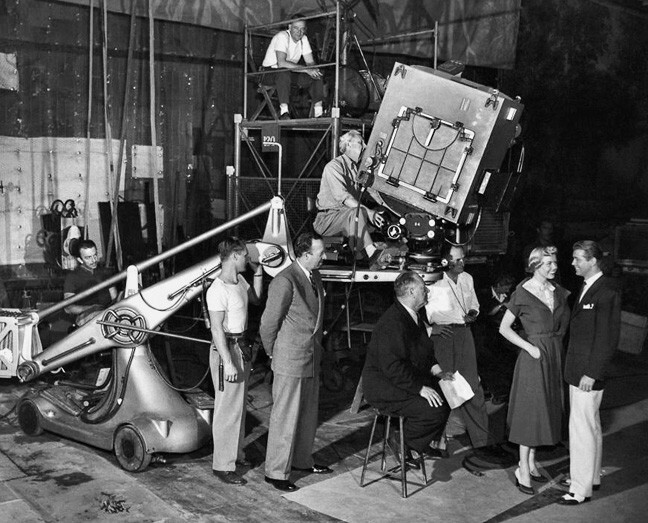 The movie came out in 1950 and is directed by David Butler. The film is inspired by the 1925 stage musical No, No,Nanette. This movie starts in the late 1920's, just as the stock market is crashing. J. Maxwell Bloomhaus (Sakall) has just found out he has lost all his niece's in the crash. His lawyer tells him to tell her the truth, but he decides to put it off for a little while. His niece Nanette (Day) is approached by her Broadway producer boyfriend, Larry Blair (De Wolfe) and offers to invest $25,000 dollars if he makes her the star of his show. Little does Nanette know that Larry is two-timing her with another actress named Beatrice Darcy (Wymore) and he has also offered her the lead role in the show. Nanette goes to her Uncle and asks for the money. He agrees to give her the money only if she can say "no" to every question she is asked for 48 hours. Her secretary and best friend, Pauline Hastings (Arden) has to make sure she doesn't say "yes" at all. She agrees and wishes she hadn't when the cast of the show show up at her house for the weekend. 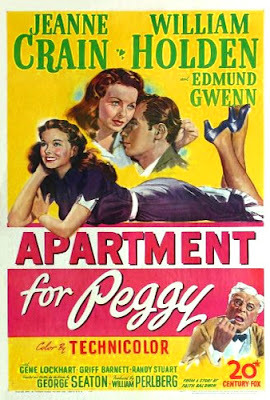 This cast of characters includes Jimmy Smith (MacRae), who is in love with Nanette. Jimmy's best friend and dancer in the show, Tommy Trainor (Nelson). And then there is a young hoofer named Mabel (Gibson) who just wants a bigger part in the show. Jimmy tells Nanette how he feels about her and ends up getting his heartbroken because of the bet. Nanette ends up winning the bet, but her Uncle informs her that she is broke. Larry walks away from her and the show, which he gives Tommy control over. Tommy comes up with a plan, which Pauline helps him with. They end up getting the money they need from Maxwell's lawyer and the show goes on with Nanette in the starring role. And of course she is happily reunited with Jimmy in the end. I sadly didn't enjoy this film as much as I wanted to. Of course I loved Gene Nelson and Virginia Gibson, but I love those two in anything they are in. I think I am not connecting with Doris Day as an actor, dancer or singer. Or it could have been the plot itself, mainly the bet part. Why could Nanette have told Jimmy that she had made a bet with her Uncle? It wasn't part of the bet that Nanette couldn't tell anyone there wasn't a bet going on. That is a huge plot hole and normally I don't like pointing those out, but Jimmy looked so sad. Honestly, if you are a fan of musicals you should see this. It was entertaining on that front. As I have stated before Gene Nelson is amazing dancer and should be admired for it. Day and MacRae were good in this movie, but they weren't the stand outs for me. If you are not a musical fan, you should skip it. It is your typical Classic Hollywood musical. It was a bit of a letdown for me, but then again that is my opinion. 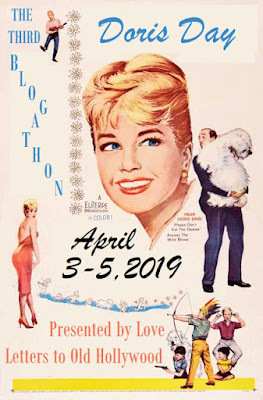 This post was written for The Third Doris Day Blogathon. If you want to read the rest of the posts go here. Ah yes, sometimes it's a bit frustrating navigating around plot holes, isn't it, especially when a situation could be easily solved. One thing I always wondered is why they didn't use the title "No No Nanette" for the film? It's so much more interesting than "Tea for Two". I agree! It is a much more interesting title. I am assuming the studio had something to do with it. I normally overlook plot holes, but I couldn't this time. She didn't make a bet with her Uncle not to tell anyone about the bet. She broke poor Jimmy's heart! 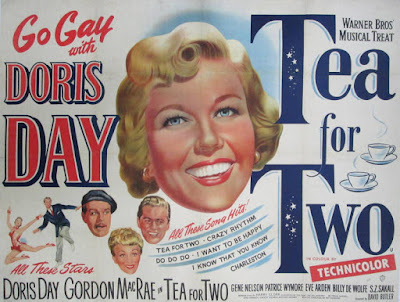 Tea for Two is a let-down for me as well, and I am a huge Doris Day fan; have been since childhood. And I love Gene Nelson and the rest of the cast. The movie just does not have the zip and zing that it should. I lay part of the blame on the studio not shelling out for the proper 1920s era costumes and atmosphere. I am sad to say I haven't seen a lot of other Doris Day films. I really want to like her, but I am just not clicking with her I guess. And maybe it is this film. I don't know. I am going to try out your recommendations though! All it takes is one role or movie to change your mind. It may happen in this case. I hope so! I really want to like her movies. That's unfortunate that you haven't found the right Day film yet, but you never know! I think Caftan Woman's recommendations could definitely help you. Tea for Two is certainly not one of her best, but I love all of the musical numbers, especially Gene Nelson's. He is such an underrated talent. I'm sad I haven't found my Doris movie yet and I was hoping it would be this one! I am going to check those movies out when I get the chance. The musical numbers were and the best and Gene was my favorite part of the movie! He is so entertaining! You're welcome and thanks for letting me be part of it.